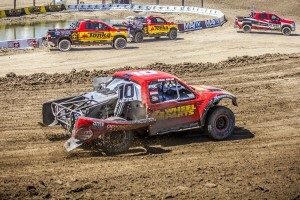 Browsing articles tagged with " podium"
Compton, California (June 2, 2015) – Greg Adler withstood numerous late race challenges to capture a spot on the podium at this past weekend’s Lucas Oil Off Road Racing Series Pro4 finale at Lake Elsinore Motorsports Park. After a disappointing Saturday main event in which Adler’s charge through the field was halted by a late race mechanical issue causing him to settle for a 6th place finish, Team 4 Wheel Parts found redemption on Sunday afternoon, completing the race weekend with a hard fought third place trophy and renewed momentum as they make their climb through the Pro4 standings. As temperatures soared into the 90s, Saturday’s capacity crowd was treated to a thundering rush of high-octane fueled adrenaline at the series’ signature track in Lake Elsinore, California. 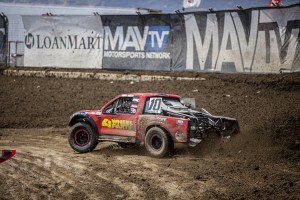 Although a strong qualifying effort found Adler on the front row of the grid for Round 5, the drop of the green flag saw the Pro4 field charge into turn one and in the ensuing chaos Adler was shuffled back into the pack of 900HP machines. Once settled into his rhythm, Adler maintained sight of the leaders as he charged his way back into contention. Now in fourth place and setting his sights on a podium finish, he found himself battling with another competitor as they soared toward the track’s signature “ski jump,” launching the two through the air and bringing them together in the process. The contact resulted in a brake issue for the #10, causing Adler to adjust his pace accordingly and bring the truck home to a 6th place result. Once again qualifying well, Adler’s second row position on the grid put him toward the front of one of the most competitive Pro4 fields in recent memory. Holding his ground through the start, he pushed his way into third on the track as he worked to catch the leaders. With just a small handful of laps to go late in the race, a yellow flag brought the pack back together for a sprint to the finish. Although he was challenged for the spot through the final laps, Adler held his ground and brought the truck home for his best finish of the young season. 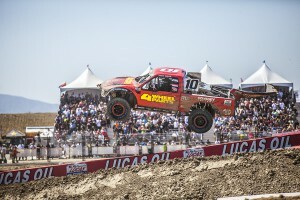 The 18-round Lucas Oil Off Road Racing Series now heads to the picturesque Tooele Valley, just outside of Salt Lake City, Utah for Rounds 7 & 8 at Miller Motorsports Park on June 20-21. 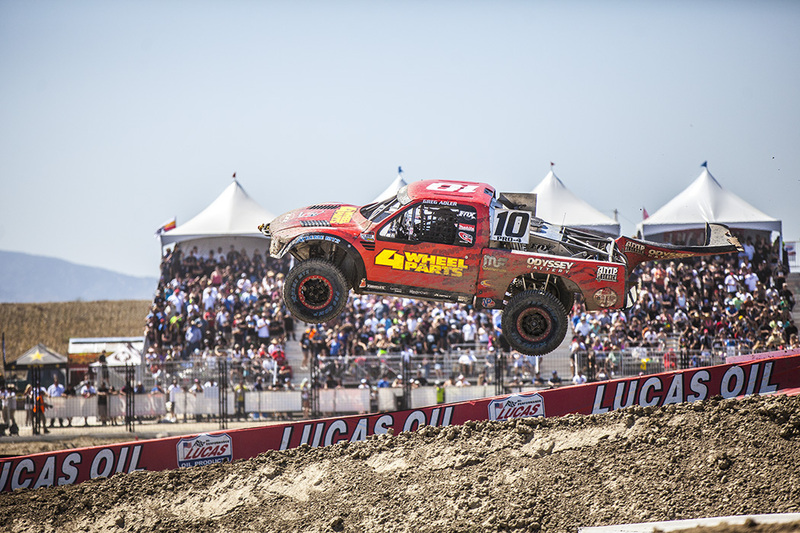 The 2015 Lucas Oil Off Road calendar includes one more visit to Lake Elsinore this season in addition to California’s Glen Helen Raceway, stops in Reno and Las Vegas Nevada and for the first time ever, Ensenada, Mexico. Follow Greg Adler Motorsports on Twitter, Instagram, Facebook and Team4WheelParts.com. 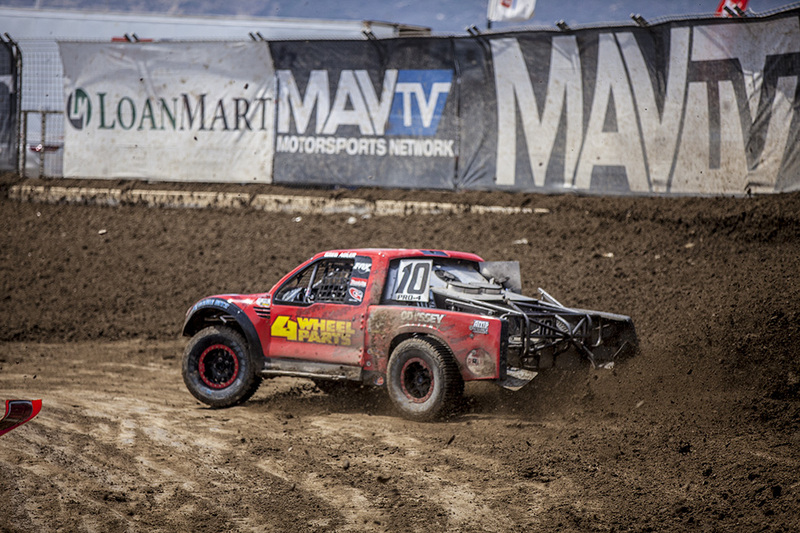 Lucas Oil Off Road Racing is broadcast all season long on CBS, the CBS Sports Network and MAVTV. 4 Wheel Parts is the global leader in truck, Jeep, SUV and off-road aftermarket performance products. With 69 locations across the U.S. and Canada and growing, 4 Wheel Parts Service Centers install all the products they sell. Maintaining the nation’s largest inventory of truck tires, wheels and bumpers, 4 Wheel Parts serves customers across the country and around the globe. Life is Better Off-Road™. Visit them at 4wheelparts.com or call toll-free 877-474-4821.